Sadly for me this evening, Grease was not the word. 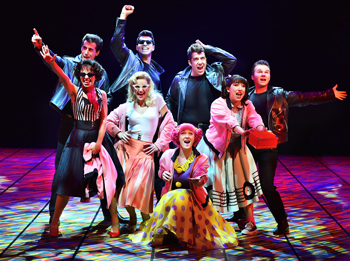 One of the most well-known and adored shows by both young and old alike, and with every song a 'hit', this is truly an iconic Musical which has been with us for almost 50 years. It is also one of my favourite Musicals too, and was really looking forward to this. Tonight's presentation however, by producers Paul Nicholas and David Ian, was Curate's Eggish at best. The first thing which greeted the audience on arriving in the auditorium was an open set with stark straight and gaudy columns filled with lights which were omnipresent throughout the Musical but did not evoke the mood, era or genre of the piece, and some of the Lighting effects used this evening were directed directly at the audience and were simply blinding and too much. The band, under the direction of Griff Johnson, on a plinth above the stage towards the rear opened the show, and dressed appropriately were in fine form this evening. The sound, especially for Greased Lightnin' was way too loud though, assaulting the ear-drums; and some of the arrangements of the music were also distinctly too modern for the 1950s era, which again did ruin our enjoyment of the music somewhat. This performance is very much at the start of a longer tour, and so it did seem this evening that some of the cast were still finding their roles and their characters. Danielle Hope as Sandy was very good, and her rendition of 'Hopelessly Devoted' was excellently performed, but her transformation into vamp at the end was somewhat weak. Tom Senior's Kineckie looked and acted every inch the T-Bird that he was, but sadly had a tendency to shout everything rather than speak. More believable and likeable performances came in the form of Doody (Ryan Heenan), Roger (Oliver Jaconson), Sonny (Michael Cortez), Jan (Rosanna Harris), Patty (Gabriella Williams) and Frenchy (Rhiannon Chesterman), with my favourite of the two gangs being Lauren Atkins' loveable interpretation of Jan. They were given excellent support from a talented and energetic ensemble with some absolutely lovely choreography from Arlene Phillips. 'Those Magic Changes' took me by surprise and was both very humorous and excellently danced. Darren Day took on both Vince Fontaine and Teen Angel, and (almost) stole the show with 'Beauty School Drop Out', although the modern references towards the end of this song really spoilt it completely; out of time and out of context. As Vince, and I am sure he will be more than flattered to note this, he simply didn't look old enough! However, there were two on stage tonight who, sadly, did not have what it takes to fill the shoes of two of Grease's protagonists in an 8-shows-a-week Number 1 touring production. Sadly there is a massive trend at the moment - I guess in a bid to get bums on seats - for producers and casting directors to choose 'celebrity names' in leading roles whether or not they are capable of performing these roles. In tonight's production, there were two such 'stars'; neither of whom were right for the parts assigned them. They both looked awkward and out of place, and their characterisations very weak. This really is such a shame. 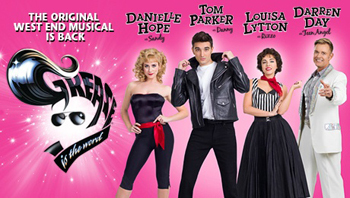 I speak of course of Tom Parker (Danny) and Louisa Lytton (Rizzo). Neither had the power or charisma to carry these essential roles off, and as such the pace, energy and immediacy of the dialogue and songs suffered. I think this is perhaps the reason why the other cast members tended to overplay their hands somewhat to try and compensate for this. The characterisations in this Musical are not deeply underscored and flawed as you would expect in Shakespeare, but neither are they mono-dimensional cardboard cut-outs, which they were very much in danger of becoming. The American accents were also very questionable too unfortunately. Hopefully, as the cast bed-in more into their characters these things will iron themselves out, and it will become the one that I want, oo, oo, oo!